May 9, 10 & 11, 1963. BB wrote “For our last production this season I had hoped to have produced The Queen and the Rebels, but I found through unforeseen circumstances I was unable to do so. Mrs. Penney suggested Mr. Bolfry and after I had read it, I liked it so much that I decided to do it. It has its pitfalls, and I hope that nobody will be upset. FOR their last production of the season, at the Barn Theatre, Southwick, last week-end, Wick Theatre Company chose James Bridie’s Mr. Bolfry. The play was a queer mixture of comedy and verbose philosophical argument, between a straight-laced Free Kirk minister in the lonely Scottish Highlands and the Devil – Mr. Bolfry, who came vividly to life when ‘raised’ by the bored household taking their instructions from an old book on devil worship. It was not everyone’s idea of popular entertainment, but thanks to an exceptionally talented cast the production can be classified as a success – if not a glowing one. Producer Bess Blagden had assigned the contrasting rôles with discernment, and each player fully justified selection. The admirable setting helped to make more creditable the total probability of the play. There was a compelling performance by Ian Elliott in the title rôle and Ralph Dawes, as the Minister, Mr. McCrimmon, also sustained a difficult part with a fine sensibility of the requirements. Clodagh O’Farrell, as his wife, brought real finesse to her performance, as did Sally Goldsmith, playing Jean, the minister’s outspoken niece. Raymond Hopper’s droll study of Cohen, the disgruntled soldier billeted far from the familiar sights of crowded London, was a joy, and Barrie Bowen, as his comrade, Cully, with more brains and less gift of the gab, also impressed more than favourably. Ably completing the cast was Fay Sturt, competent and the maid, Morag. The setting was designed and built by stage manager John Perrett, and the decor was by the producer. Assisting backstage were Elizabeth Courtney-King, Frank Hurrell, Morfydd Bowen, Margaret Perrett, Grahame Snow and Mary Chinchen. THE Wick Theatre Company more than distinguished themselves with their production last week of James Bridie’s Mr. Bolfry. It is an extremely difficult play with a range from low comedy to theological argument. The story happens on a Sunday in the Manse of the Free Kirk at Larach in the Western Highlands of Scotland where two soldiers on a gun post are billeted and bored; where a niece of the Minister is on holiday and bored; and these three, together with the maid servant, Morag, using the formula found in an old book in the Manse library, successfully summon up the Devil, Mr. Bolfry. The two soldiers are Cohen, known as ‘Conk’ from the Borough road, played with a keen sense of character by Raymond Hopper, and the intellectual Cully who is given an authoritative reading by Barrie Bowen. As the niece, Jean, Sally Goldsmith gave the impression of being a little unsure of herself and this unnecessarily since, with a little more attack, her playing would have merited a mark of excellence. The Minister, Mr. McCrimmon, was made an awesome figure by Ralph Dawes, inflexible in holding to the uncompromising tenets of his faith, bewildered by the specious and near-logical argument of Mr. Bolfry and impressive in the courage with which he faces his adversary. As his wife, Clodagh O’Farrell contributed a gem of character acting. Her quiet authority, her truly humble acceptance of the life to which she had been called, and her skilful but unobtrusive handling of the situation was really quite masterly. Morag, the servant girl, easily persuaded yet forever fearing the wrath of the Minister was well played by Fay Sturt. 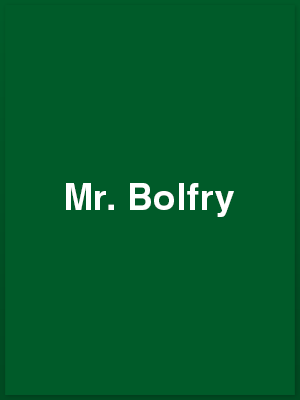 The difficult task of playing Mr. Bolfry was achieved with great ability by Ian Elliott. The author has given to Mr. Bolfry a speech of inordinate length in which he expounds his Satanic philosophy but skilful handling made it of sustained interest. The part, too, was well observed in detail. John Perrett has designed and built an exceptionally good setting, and Bess Blagden has done a good job of production. Despite the difficulties of a small stage I could have wished that Mr. Bolfry had shown more respect for the mystic circle by which the others were protected from his predatory presence.